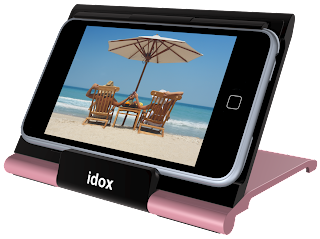 Ascending Butterfly: Idox360 Review & Giveaway - protect your iPod or iPhone and view video on the go! 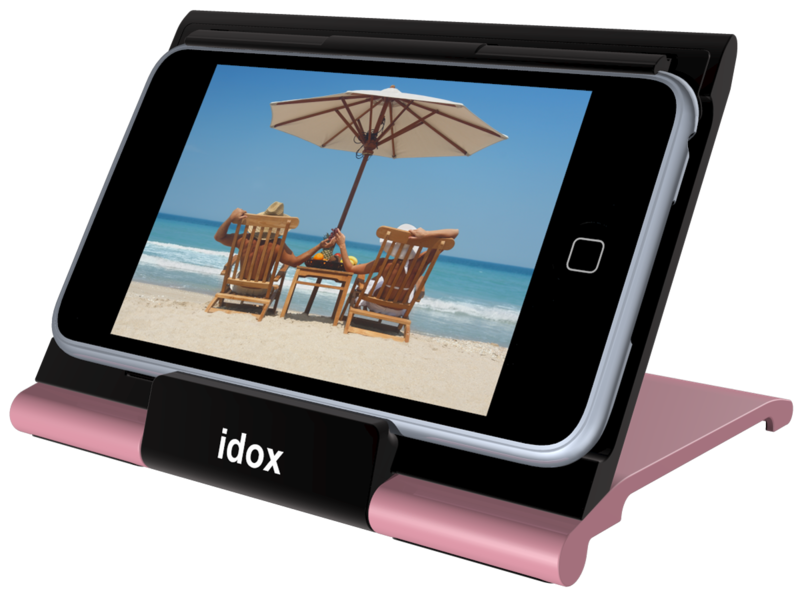 Idox360 Review & Giveaway - protect your iPod or iPhone and view video on the go! This giveaway is now CLOSED. Thanks so much to our wonderful sponsor Idox360! We look forward to working with you again! The winner is anthy! Remember: There are great giveaways active on the upper right hand side of the page! I am a total tech nerd and gadget geek, and with a love of gadgets comes a need for a plethora of accessories. I love it when an accessory for my gadget does double or even triple duty! One of my favorite among my gadgets is my iPod Touch. It holds thousands of music files, videos, apps, books & pictures. Like some with their American Express, I never leave home without it! As many of you know I'm a typical New York City girl who never learned to drive. Parking and traffic are pure nightmares here and it just never seemed necessary with such a wide variety of public transportation options, my favorite being the express bus that takes me into the city. I love to sit back, put on my music or a video podcast and leave the driving to the bus driver! Makes for a nice relaxing start to the day! While I love traveling with my iPod, I'm always careful to make sure it's protected, let's face it, my handbag is somewhat similar to a bottomless pit, and stuff gets knocked around in there a lot while in transit. But the one thing in there I don't want to jeopardize is my iPod. It already expresses my individuality with a custom skin that I just love, but that skin is purely fashion, it doesn't keep it protected from impact in any way. That's where the very smart folks at idox come in. They created a pure genius product for your iPod and iPhones, it's a stand/holder and a protector case all rolled into one. It's an editors pick for good reason! I've had a chance to road test it and I love it, my iPod fits perfectly, does not come out or slide, it pulls out only when I am ready to take it out. I can watch a movie now without having to hold the iPod in my hand the whole way anymore (insert singing choir here) and it also completely protects my iPod from the perils of my handbag, particularly when the whole bag gets bumped about when I'm traveling and passing through airport scanners. Honestly I can't rave more about it, My iPod is now protected from scratches from having makeup cases bump up against it, or the pressure of having tons of stuff piled upon it. Keeping it in the idox case closed also helps me to be sure it doesn't accidentally go on when I don't want it to. Ƹ̵̡Ӝ̵̨̄Ʒ -A flip-to-view stand for the perfect viewing angle on an airline or at your desk. Ƹ̵̡Ӝ̵̨̄Ʒ -iPod touch fits snuggly inside the Traveler and folds up for on-the-go protection in your briefcase, pocket or purse. Flip Traveler open to a perfect angle to browse music and photos, view movies and podcasts. Ƹ̵̡Ӝ̵̨̄Ʒ -Hard outer shell provides wrap around protection. Ƹ̵̡Ӝ̵̨̄Ʒ -Snap closed lid keeps iPod touch protected. Ƹ̵̡Ӝ̵̨̄Ʒ -Rubber feet keep case in place while viewing. Ƹ̵̡Ӝ̵̨̄Ʒ -Easily connect to Bluetooth, ear phones, or power adapter. Ƹ̵̡Ӝ̵̨̄Ʒ -For the 2nd and 3rd generation iPod touch. Ƹ̵̡Ӝ̵̨̄Ʒ -Available in Platinum, Black and Pink. Don't you just ♥ Idox360? I know I do! How to Win: (1) You must be a PUBLIC follower of Ascending Butterfly to be eligible for this and all giveaways. Indicate in your entry that you follow (if your 'comment name/user id' differs from your profile id, please let me know what name you follow under) and (2) Post the URL Link to which of the Travelers Series Models you would select if you win. Remember not the name, the link to the product! (3) You must also leave your email address somewhere in your comment. (You can format it this way for security, example: ascendingbutterfly AT mail host DOT com). (If your email is clearly visible in your profile, you can just say so, that's OK!) Please follow the easy 1, 2, 3 steps to winning (or in this case, the A,B,C’s of winning!) This giveaway is open to USA residents who are 18 years of age or older. Ƹ̵̡Ӝ̵̨̄Ʒ - Ascending Butterfly is a nominee for the Bloggers Choice ’10 Awards in the ‘Best Blog About Stuff’ Category - http://bloggerschoiceawards.com/ You can press the button below to go straight to the page where Ascending Butterfly has been nominated! FTC Disclosure Info for this Giveaway: This is not a paid insertion. This is a non-compensated post and all opinions regarding the products are expressly my own experiences. I was provided product to facilitate my review and for the giveaway. The sponsor is fulfilling directly to prize winner(s), this in no way influenced my opinion of the product. Once a winner is selected and their information has been forwarded to the sponsor, the responsibility of prize fulfillment rests with the sponsor. Thank you very much for the giveaway - I'd love to win this for my nephew. I now follow you on twitter, @my_twitraccount. I follow idox360 on twitter, @my_twitraccount. I voted for you in Bloggers Choice ’10. I'm "anthy" over there, too. Hi! 1- I'm now following your blog publicly via GFC. 3 - my email is in profile and i have a contact form on my blog. I faved your blog on Technorati! I'm "anthyq" over there. if my original post is posted twice sorry, but it went to an advertisement so I figured that I pushed the wrong button. "Liked" Idox360 on FB and wrote on their wall. I subscribe to receive Ascending Butterfly emails. I follow publicly as s carter. Winner Announcement - Is it YOU? Today's Words of Inspiration - Tweetspiration! 2 Winner Announcements - Is it YOU? Typing as fast as I can! Wordless Wednesday! Be A Butterfly! Take a “Road Trip” and win with Carolina Pad! 4 Winner Announcements - Is it YOU?